Measuring only 3 1/4" inches tall "Overall Length"
Our valve is complete! With features such as a low pressure swivel for your hose! Includes a psi/bar small spg installed on the valve! 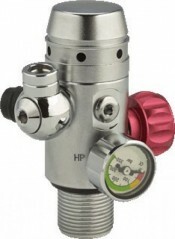 The regulator first stage has a balanced piston with an intermediate pressure set at the factory at 100 psi so you are ready to go right out of the box! These valves are ready for nitrox use also! The IP on this valve can be adjusted and you should have a qualified regulator technician do any adjustments on the IP unless you have been trained to do so! Uses a #813 rebuild kit and these are made with viton o-rings! One way fill valve port for easy filling with a rubber protective cap "You may need to purchase a fill adapter if you do not have one already! Please see below"